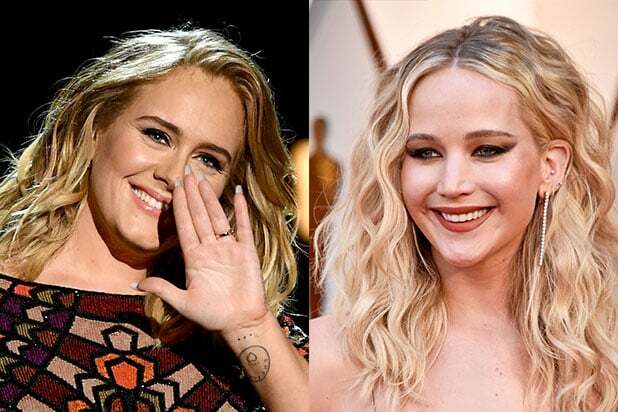 Adele and Jennifer Lawrence really lived it up on Friday night as they hit up New York City gay bar Pieces, where the “Hello” singer played a round of musical shots… and was promptly tackled by her bestie when she lost. Other videos have started circulating on Twitter and Instagram from their big night out. In one video, the Grammy winner is on stage with Brita Filter, telling the crowd, “Hi, I’m Adele!” and that she’s currently a stay-at-home mom. Lawrence and Adele have been best buds for a while — in 2015, they had a big outing with pal Emma Stone in New York, as well. See below for videos from the BFF’s Friday night shenanigans (be sure to click right, as it’s a carousel).